I am aware that half of our semester has already passed and everyone is quite busy preparing for midterms, theses, etc. But, as the old saying goes, all work and no play makes Jack a dull boy. Don’t wanna be dull? Let’s go downtown and have afternoon tea together then! As a big fan of the SET Genki Tei Restaurant in The Hague, I have been pretty much attracted by the advertisements about those cute little Hello Kitty cheesecakes that you can only find in SET cafe (which is right next to the restaurant). So, a few days ago, my friend and I met in the city center of The Hague and decided to have afternoon tea there. I called the cafe the night before because I thought I needed a reservation. They told me that if you want the Hello Kitty afternoon set (which includes sandwiches, cheesecakes, and some warm drinks), you need to make a reservation two days before hand and you can only have it in the restaurant. For my friend and I, the atmosphere at the SET cafe seemed more important, so we directly went there to make our own choices. It was a Thursday afternoon, so the cafe was not very busy. I was amazed by the decorations – I mean, look at it! Isn’t it just cute to sit here and forget about all the assignments and deadlines you have? My friend ordered Hot Matcha Marshmallows, and I had Hot Matcha Latte. We both had Strawberry Hello Kitty Cheesecakes. They were surprisingly good! They were very sweet, and they had a quite natural taste. Yum yum, liked! Hanging out with friends on a sunny afternoon in spring is such a wonderful thing. I can’t wait for Keukenhof to be open actually; I haven’t been there for two years, and I really miss the spectacular nature in there. I’ll keep my little trips in the Netherlands updates. Ciao for now! 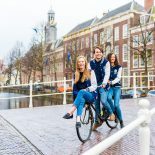 This entry was posted on March 19, 2016 by in Culture, Leisure, Living in Holland, Practical Stuff, Student Life, Travel, Xueyan and tagged afternoon tea, cheesecake, food, hellokitty, international student, leiden, relaxation, The Hague, Xueyan, Xueyan Xing.